With its recognized expertise in the design of exceptional coffee mills, Peugeot has designed a coffee maker with an integrated mill for coffee lovers, which is as aesthetically beautiful as it is practical. In choosing to combine the very best of French know-how with Italian gastronomy, Peugeot is providing coffee lovers with a clever coffee maker and integrated mill combination to grind fresh coffee beans. 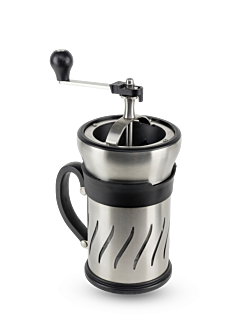 Simply add hot water and then push the piston down to release all the intensity of the full-bodied aromas and enhanced flavours; just as a coffee infusion.